After a scrumptiously sunny, jam-packed winter season, summer is a’ comin’ here in roasty-toasty South Florida. As we say a teary good-bye to our winter friends who’ve spent the past month packing up for their annual 5 month pilgrimage to northern climes, we turn our sights to personal possibilities for a siege into the long tunnel of Limp Hair Days (LHD). So you’ve laid in a lifetime supply of batteries and “WD-40ed” your hurricane shutters. Now what? Lets identify a few machinations to keep the mold out of our cerebral cogs. The mid-day siesta, long the solution to languid summer days will obviously not be good enough for your sharp intellect and ongoing quest for cultural satiety. U of M’s Cosford Cinema has been a staple for foreign film and Film Festival fare for eons. Located in Coral Gables, it has been a hidden bauble for the more thoughtful cinematic fan base. Capable of wide Screen and 35 mm, the Cosford also boasts a lecture series of world-renowned speakers. 1111 Memorial Drive, Coral Gables, 305.284.4861, www.cosfordcinema.com. Miami Beach Cinematheque has kicked it up a notch with their jazzy new digs at historic Miami Beach City Hall. Long loved by locals for thoughtful film offerings and warm community consciousness from its perch on Espanola, the new Washington Avenue MBC houses a gallery, bookstore and library. The vibe has not been diminished by the move. They got it so right-paying attention to style, the use of earth-friendly building materials as well as focusing on a comfy ambiance. Do not go if you want to be alone…all your neighbors are there on any given night… trust me. Award winning new films and classics are interspersed to provide a full viewing menu. 1130 Washington Ave., Miami Beach, 305.673.4567, www.mbcinema.com. O Cinema is the new kid in town located amongst the ever-evolving stew of life erupting in the Wynwood section of Miami. Their aim is to incorporate programming appealing to all facets of the population. A separate space called Monitoring Art will explore the video art realm. Several artists’ galleries on site complete the patchwork of interests available at O. If you wish to participate in the ongoing maturation of Miami’s cultural quilt, O Cinema Founders Circle members will receive a years worth of free admission to films, events and previews. Each dollar donated will be matched by the Knight Foundation. Did I mention there is free parking? 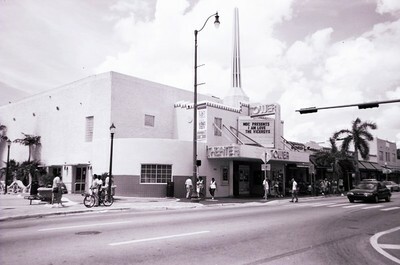 90 NW 29th St., Miami, 305.571.9970, www.o-cinema.org. Alliance Francais provides French language classes, lectures, art exhibits and film series. You might want to brush up on your French by attending a few summer classes before honing your new found talent with the films. You just missed the Romance in a Can Festival but drop by every 3rd Wednesday for a concert of Saxophonist, Nestor Zurita and check out what’s-what at the same time. 618 SW 8 St., Miami. 305.859.8760, www.afmiami.org. The Coral Gables Art Cinema is another newbie on our block. Deemed as multi-cultural and multi-lingual: animation, short films, Indies, foreign, classic…throw in a few live performances and educational events and we have another venue to add to our list of “must-dos.” 260 Aragon Ave., Coral Gables, 786.385.9689, www.gablescinema.com. The Tower Theater has the distinction of inhabiting an Art Deco Miami landmark building originally opened in 1926. Since 2002 Miami-Dade Cultural Affairs has managed this terrific addition to our cinematic landscape: free lectures by MDC and community scholars round out the programming focusing on the Caribbean, North and South America. 1508 SW 8th Street, Miami, 305.642.1264 www.mdc.edu/culture/tower.htm. No need to travel far from the Mothership to be able to discuss nuances of more obscure film features previously available only in New York, while maintaining your cool demeanor both in intellect and body temperature.